It's a long shot but wondered if anyone knew what lake this is? 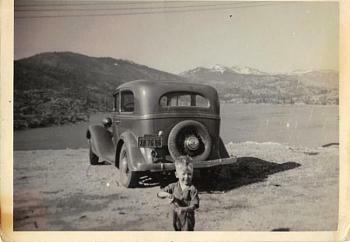 The car, a 1935 Chevy, has California plates and I assume the lake is in that state. Any guesses or hard facts? Would sure appreciate any info! Are those (3) power lines on the top of the picture? Yes! Could be more as that's the top of the picture, but I think 3 is it. What are you thinking? Well, if this is indeed a lake in CA, the area in the Kaiser Wilderness had, has, many lakes/reservoirs for hydroelectric power. These projects started, I believe, back in the 30's and 40's. This area, Kaiser, Shaver Lake, Dinky Creek has many reservoirs that can be driven to. From the picture it looks like the car is on a earthen dam or at the very least soil that has been graded by machinery. Do you have more info on where the owners of the car lived? Southern CA? Northern? What year do you think the picture was taken? So...it looks like an alpine lake that is high enough to still have snow on peaks near it in the summer (the boy is not dressed for cold weather) and has power lines. Doesn't narrow it down much!! One other thing...is that a defect on the picture right of the middle just under the power lines? Or, is that a ball on a wire as a marker so airplanes won't fly into a cable/wire? Also, on the right side on the picture...is that a dock on the water? It may be me, but it doesnt look like that's sand under the truck. It looks more rocky and dirt. maby look into rock quarries rather than a lake. Well, since you've only included all of California, that purdy much narrows it down. Seriously, it could be anywhere. Where the car is parked could be a dirt road, top of a dam, just about anything. It does appear to be looking to the NW due the shadows making it look to me like it was an afternoon shot. Where did you find the pic? Well i can't recognize properly but i can guess this is the photo of bill gate? what you think m i right? You are so wrong it's not even funny, Mr. Punjabi. Good Bye! I hope you don't run into him on the phone while getting your computer fixed!